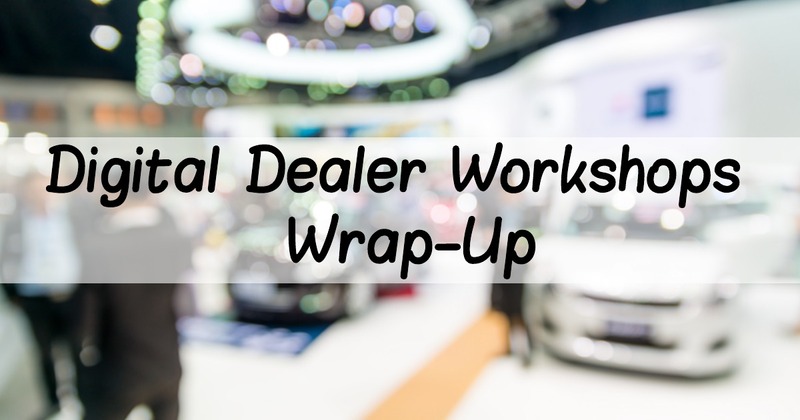 We just got back from Digital Dealer Workshops, which took place in Chicago last month. Held in McCormick Place, the conference is a meeting place for automotive professionals from around the world to network, educate and get up to speed on the latest in automotive news and technology. As one of the largest auto shows of the year, with over 38 educational sessions, we were thrilled to return and exhibit! Stacey, what would you say was the big buzz word this year? Robots! No, but seriously every session and booth was buzzing about artificial intelligence and machine learning. It’s not a surprise considering that along with shoppers getting smarter, technology is getting smarter and learning new things every day. Dealers were definitely concerned with how to use these new learnings to drive sales. I was secretly excited to know that Netsertive is ahead of the game. Our proprietary technology by design learns from all of the dealers in our network and constantly analyzes and updates campaigns based on real-time feedback – several hundred adjustments a month are typical! What was your favorite topic at the show? I speak on behalf of myself and all the dealers when I say, Facebook! Facebook is always one of my favorite topics and you could really see all of the dealers lean in anytime there was a mention of Facebook. Be it lead ads or canvas ads, Facebook is an inexpensive and targeted way to move inventory. Scott Meyer, from 9 Clouds, was one of my favorite speakers and he spoke a lot about Facebook being an excellent tool to help dealers chase the sale and target audiences that you know will covert. At Netsertive, we’re all about eliminating the guesswork so I was thrilled to hear another speaker mention that. What would you say was the biggest concern for dealers? There were lots of concerns about attributing sales to different marketing channels and of course, there was a lot of talk about the decline in new car sales this year. In general, dealers were asking lots of questions about getting match backs from vendors, how to know that their marketing dollars are being properly allocated and ways to combat economic variables affecting car sales. This wasn’t really a huge surprise. We talk to our dealers on a consistent basis and hear the same concerns. It’s one of the main reasons we focus on transparency in our reporting and have frequent strategy calls to get in front of these concerns and put marketing strategies in place to ensure that they’re constantly moving inventory and staying in front of their competitors. Netsertive will be exhibiting at Digital Dealer next month in Orlando. What are you most looking forward to? Chatting with more dealers! I love to chat about marketing and help dealers to unleash their full potential to win local auto customers. I encourage anyone to stop by booth #345 in Orlando and chat with our team of automotive experts! Here’s a sneak peek of our booth we’ve been unveiling as well! Hope to see you there!